Four Venezuelan grain buyers who came to South Dakota to get an up-close look at grain production, quality and storage got more than they bargained for. They got to ride in a combine during harvest. The Venezuelans said they had hoped they would have an opportunity to experience a harvest, but they realized they were at the mercy of many factors out of their control, particularly unpredictable weather. Mother Nature cooperated, with sunshine and a temperature near 80 degrees during their Sept. 21 visit. The U.S. Grains Council organized the trade team’s visit to the United States. South Dakota Corn was the local sponsor. The visit included stops in North Dakota, Iowa, Nebraska and finally Louisiana, where they toured an export terminal. In South Dakota, they visited the Mark Gross farm near Bridgewater and toured the Central Farmers Cooperative and NuGen Energy ethanol plant, both in Marion. 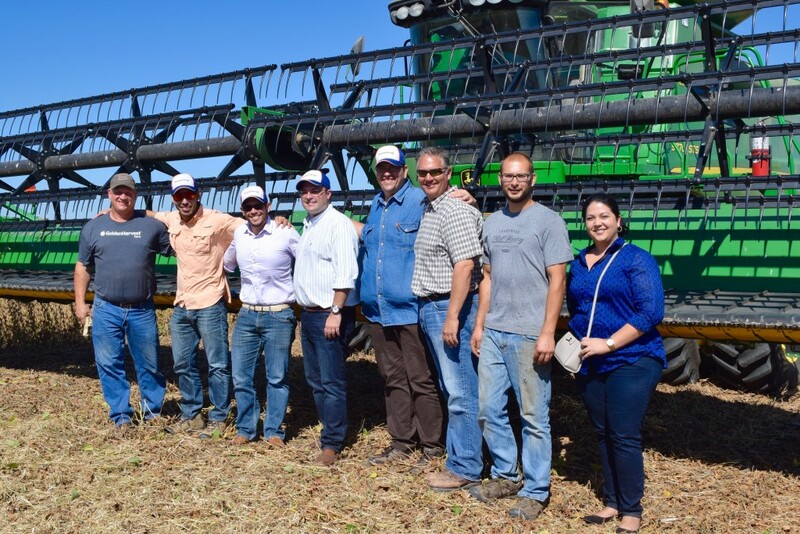 The visitors said they were impressed by the quality of grain, the size of the equipment and facilities, and the overall efficiency they witnessed. “It’s eye opening to see how things can be done,” said Jorge Arturo Vasquez Maldonado, a marketer for Cargill de Venezuela. Gross, who is a South Dakota Corn Growers Association director, provided an up-close look at his corn crop and let his guests ride in a combine that was harvesting soybeans. He said these types of exchanges are beneficial in building relationships with foreign customers and creating more trade opportunities. Venezuela is a large importer of U.S. corn, most of which is used to make livestock feed. Members of the trade team were unfamiliar with distillers grains, but learned a lot and will look into possible imports of that ethanol co-product.